Let's talk chambray. It's just about dress time this spring and I am loving the easy and casual feel of denim. While some trends are saying the Canadian tuxedo is making a comeback, I'm not buying it. I'll stick with the standard shapes and styles like today's look: the chambray dress. I love the dark wash on this dress. I would swap out the belt with something leather for a bit more structure. For this price point...sign me up. It's simple, fitted, and chic. How sweet is this dress? It's breezy and casual and ready for a chunky sandal. Let's dress it up a bit with this embroidered option that is still under $60. 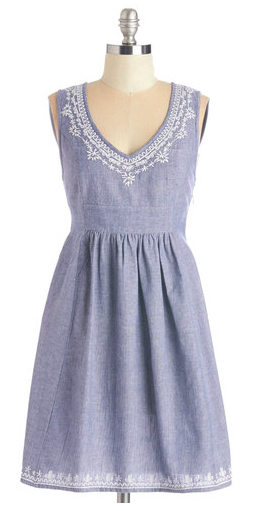 The chambray dress comes in all shapes and styles and more importantly, all price points. The best part about this trend is you can have a handful of dresses in your closet and they are nothing alike. So get shopping!